These handwriting sheets can be found on Twinkl. Click on the hands below to follow a link to 'Teach Handwriting', a website full of ideas and resources for developing handwriting skills. It includes handwriting sheets and animated clips which demonstrate the continuous cursive letter formation. In order for children to develop good handwriting skills, they need to develop four key physical strengths. Sometimes children need some extra support to develop one or more of these key physical strengths. This is the body's ability to send accurate sensory messages about 'touch' to the the brain, so the muscles can move correctly. 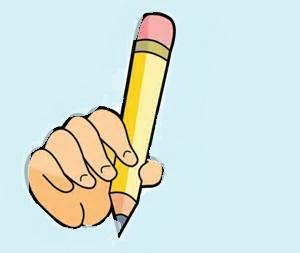 These fine motor skills enable your child to hold a pencil correctly and apply the correct pressure when writing. Well balanced movements and coordinated use of the left and right sides, enable a child to write freely across the width of the paper. Strength and agility of the muscles in the hands and fingers enable a child to manipulate a pencil and form letter shapes. All children are different and develop at different rates. However there are activities and games they could do to develop strength in any of these key areas. Click on the hands below to follow a link to 'Teach Handwriting', a website full of ideas and resources for developing the all of the above pre-handwriting skills and cursive letter formation.